Hans Albers took acting lessons against his parents' wishes and debuted in 1910. He was seriously wounded during the First World War and went to Berlin afterwards. After Max Reinholdt engaged him at the Deutsches Theater he became famous. In 1930 he played next to Marlene Dietrich in "Der Blaue Engel". He had a relationship with the Jewish actress Hansi Burg, who fled to England for the nazi's. Albers was questioned by the Gestapo, but he was so famous that he was soon released. He was successful in the non political movie "Münchhausen" (1943), but Goebbels put pressure him to act in "Große Freiheit Nr. 7" together with Ilse Werner. After Hamburg was bombed the production of this movie was relocated to Berlin and Prague. In these years Albers developed a serious drinking problem. After the war he was reunited with Hansi Burg and they lived at the Starnberger See near Munich. In 1958 he expressed a political view for the first time, speaking against providing the Bundeswehr with nuclear weapons. Shortly before his death in a clinic he finished "Kein Engel ist so rein" (1960). After his death the Wilhelmsplatz in Hamburg was named after him. Movies: "Münchhausen" (1943); "Das Herz von St. Pauli" (1957). The grave of Hans Albers at the Ohlsdorfer Friedhof, Hamburg. 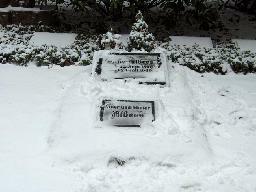 The grave of Hans Albers at the Ohlsdorfer Friedhof in Hamburg.